On this week's savvy shoppers, Becky from 3 princesses and 1 dude shares her tips and advice for shopping and cooking for her family of 6! 1. What is your weekly budget for groceries? We don't really have a budget, but I try and aim for less than £60. 2. What's your meal plan this week? S - Meatloaf, mash and veg. 3. Where do you shop the most? I shop around, but our weekly shop is an online Asda shop, finished off with bits from Poundland, Home Bargains and Heron, which is generally the stuff I know I can get cheaper. Heron usually has great offers on yoghurts. Last week we got 2x6 pack Muller Corners for £1.50! If I had bought them in Asda it would have cost me around £5!! 4. Do you have any tips for spreading the cost of your weekly shop? 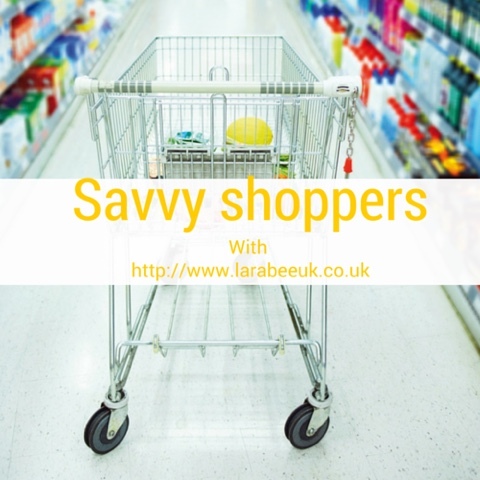 Shop around if you can, don't feel shame because your shopping in the discounted shops! (I actually used to avoid shops like Poundland and Heron, which I look back now and just think it crazy!) and make use of offers on stuff you know you will use. There is quite often offers like 3 for £10 on fresh meat's. 6. What would you say is your biggest shopping weakness? 7. Does everyone in your family eat the same meals? Yes, you eat what you get, there is no alternative! And if its the hubs who 'doesn't like it' (he hates veg) well he can either pick out the veg or make his own after the kids have gone bed! 8. Do you coupon or use any of the shopping apps? Any advice, hints or preferences? No, although I probably should. 9. What's the most important factor in deciding your family meals? Ermmm...If I want to cook it! Does it look like I could cook it? Is it made in a way I know how to cook? Can I change a recipe to make it my own? 10. What's your go to store cupboard pudding? 11. Do you stockpile? Any advice or tips? I want to say no, because I don't specifically buy to 'stock up'. But my cupboards are full to the brim, as is the freezer...must be those bargain buys I cant say no too!! Anything Pasta! My Crunchy Extra Cheesey Mac Cheese always goes down well! Cook pasta, make cheese sauce, combine the 2 in a baking dish, cover with a thin layer of cheese and stir in, grab your favourite crisps I find Salt and Vinegar and Cheese and Onion make a great combo! (they have to be proper crisps mind, Wotsists etc wont work!) crush them up, layer on top of the pasta and sprinkle a mix of your 2 fave cheeses on top, pop in the oven until the cheese has melted. 13. Do you do any meal prep to save time/money during the week? Not that I can think. 14. Does your family have any dietary considerations? 15. Do you batch cook and freeze meals? No. The freezer is already full!